Origin: Hamburgs carry a German name, but are generally considered to have originated in Holland, though it is unclear when. They have been known to exist since the fourteenth century. They travelled to Great Britain in the late 1700’s where several varieties were developed. The Hamburg arrive in America before the mid-1800’s. All varieties were excepted. Characteristics: The Hamburg is a mid-sized fowl with distinct features. 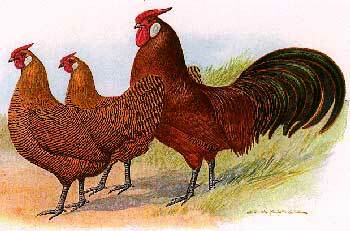 Both the male and female display white earlobes and red wattles. The fowl have a rose comb. The shanks are a grayish color Hamburgs are active, flighty birds. They are trim and stylish with delicate features, and wild in nature. The male has fantastic plumage with spangling on the tail feathers for this of the Spangled variety. There are varieties with penciling. They forage well and are capable of flying long distances. They are prolific layers because they continue to lay over long periods of time. Their eggs are neither large nor small. The Hamburg goes by many other names such as the Yorkshire Pheasant. Use: The Hamburg is known to be a great egg producer but it also has ornamental uses. Ekarius, Carol. "Chickens: Hamburg." Pocketful of Poultry: Chickens, Ducks, Geese, Turkeys. North Adams, MA: Storey Pub., 2007. 74-77. Print. "Hamburg Chicken." The Livestock Conservancy. The Livestock Conservancy, n.d. Web. 29 June 2015. Lewis, Celia. "Breed Profiles: Hamburg." The Illustrated Guide to Chickens: How to Choose Them, How to Keep Them. New York: Skyhorse Pub., 2011. 91-92. Print.